All aboard the Produce Express! Across the country, food banks are placing a stronger emphasis on delivering nutritious food, especially produce, to their local communities. The Wichita Falls Area Food Bank (WFAFB) is no exception. This food bank serves a rural region of Texas that isn’t exactly known for its vegetable growers. As a result, many families who rely on the food bank’s help find that the retail cost of fresh produce is prohibitively expensive. Unfortunately, most traditional outlets for a food bank’s free food – small, faith-based food pantries – are unable to handle the additional costs and refrigeration needed to keep fresh food safe for long periods. WFAFB responded to these circumstances in late 2013 with the introduction of the Produce Express. This just-in-time, “dedicated channel” distribution model was made possible through the timely donation of a refrigerated truck by the David Tepper Charitable Foundation. Each week, WFAFB partners with the nearby Tarrant Area Food Bank to supply the necessary produce for the program. A driver from the food bank picks up thousands of pounds of food from Fort Worth to distribute quickly and efficiently at their member agencies across north Texas. This innovation is part of the food bank’s broader goal to ensure that healthy produce is more than 25% of its total distribution. According to Director of Operations Wendell Griffin, as of December WFAFB was “on track to distribute one million pounds of fresh fruits and vegetables” by year’s end. The Produce Express has not only made an impact on how the food bank collects and distributes food – it has also generated positive health outcomes for clients. Rose Killian, a diabetic client of the food bank was recently told by her surprised doctor that her A1C levels had dropped by a full point. As a result, she would now find it easier to keep her diabetes in check. When asked what the difference was, Rose emphatically stated it was the produce distributed by the food bank. Here at Feeding Texas we’re excited about this shift towards providing more healthy food. In the coming months, we hope to work with the public, donors and the state legislature to increase our food banks’ ability to distribute even more produce. To learn how you can help us in these efforts, sign up for our mailing list. 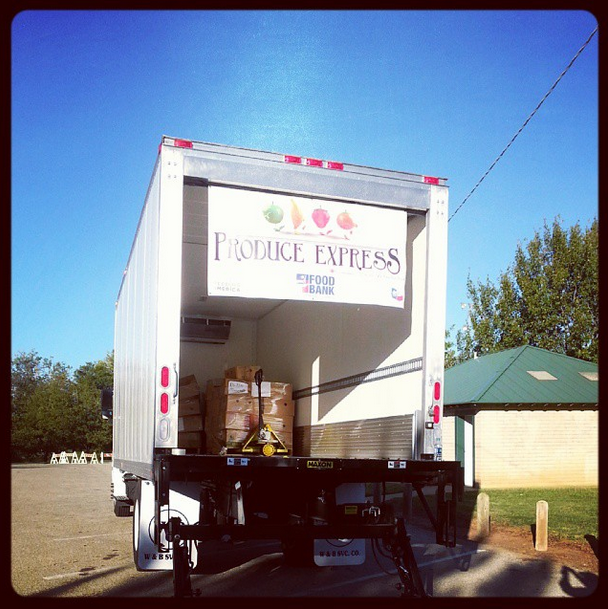 For more information about the Produce Express, visit WFAFB’s blog. Photo credit: WFAFB on Instagram.